Resistance of a material against beginning fracture growth. 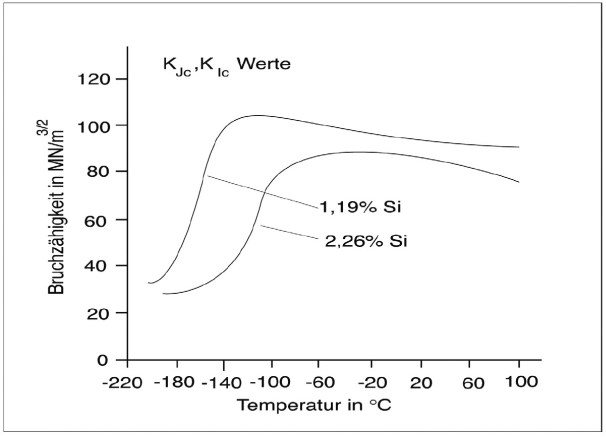 The material characteristics is the stress intensity factor kIc, at which forced failure occurs. In other words, the fracture toughness describes the risk of the respective component to fracture growth at a defined nominal tension s and the length a for an existing crack. Fracture toughness testing is described in DIN EN ISO 12737 Metallic materials - Determination of plane-strain fracture toughness (ISO 12737:2010); German version EN ISO 12737:2010. C is a constant depending on the geometry of the sample and the position of the fracture that is known for various sample types. 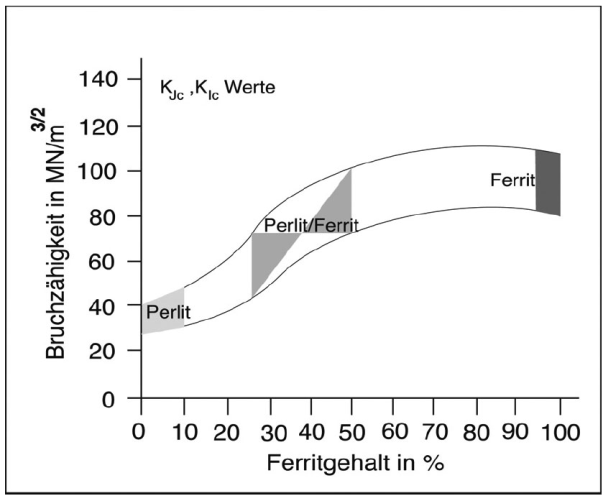 If the stress intensity factor K exceeds a critical value, either due to an increase in stress σ or an increase in fracture length a, instable fracture growth occurs. This critical value K is referred to as fracture toughness or crack toughness and determined during material testing. Its dimension is MN/mm3/2 or N/mm3/2. 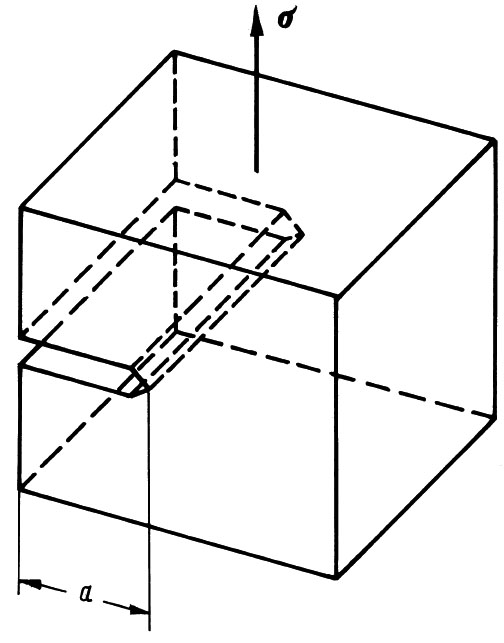 If the sample is tensile loaded and the tensile force acts vertically to the fracture areas (Fig. 1), the fracture toughness is designated with KIc. The fracture-mechanical properties of materials are increasingly used for dimensioning components. The behavior of a fracture in a material under static, dynamic and potentially also corrosive stress is a basis for modern considerations for the safety of components. Classical linear-elastic fracture-mechanical observations describe the material behavior in a relatively ductile state. This is not very suitable for application-technical observations. However, further developments towards elastoplastic fracture mechanics and ductile facture mechanics enable drawing conclusions on the material behavior in components. Respectively, the faction behavior of graphite-containing casting materials is determined by the quantity, form and size of graphite particles as well as by the structure formation and chemical composition of the metal matrix. Even 10 to 12 vol.-% graphite reduces the fracture toughness in case of nodular graphite, i.e. with a low notch factor. A fine-grained ferritic matrix with low silicon content ensures high toughness of the types EN GJS 400-18U (GGG-40.3) even at low application temperatures (Figures 2 and 3). Between graphite formation and the grain size in the matrix, there is a connection as a high number in graphite nodules favors fine-grained formation of ferrite. Similarly, pearlite in the matrix considerably reduces the toughness of materials.